Congratulations are in order. After years of hard work, someone finally noticed. 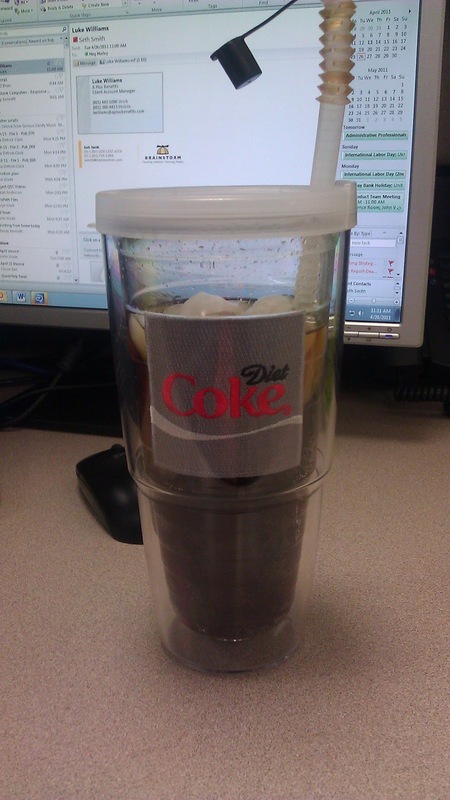 Yesterday my boss presented my with the above tumbler, and said there was no one else who deserved it more. He's right. It would be extremely difficult to find anyone as passionate about or as committed to a beverage as I am to Diet Coke. There are a whole buch of modifier issues in that sentence that I am choosing to ignore. But I can't take all the credit for my accomplishments. I'd like to thank Mom, for placing her Big Gulps in the cupholder that I could reach from the back seat of the car and steal sips without her noticing. That one babysitter that one time who believed me when I said I was allowed to have Diet Coke as six year old. Raj, at 7-11, for the discounted fountain drinks and the occasional candy bar thrown in for free with my purchase. Stephen, for reminding me how horrible all my past attempts at quitting have been. Each mission companion, for only rolling their eyes every time I said it was time for another Coke Light. And finally, my coworkers, for keeping the fridge stocked with my aspartame-filled beverage of choice at all times. You have all made me who I am today, an addict, a lover, and a caffeinated fiend. Thank you. My favorite is when you would walk down to Roman Gardens or wherever on Sundays so you could buy a coke from the vending machine. Ah yes, I forgot to thank those vending machines for helping me keep the Sabbath Day holy. i'll drink to that. cheers to caffeine addictions!